Joy Center for the Disabled, International – NCDA Interface. On the bottom left picture, standing from the left: Pastora Agnes B. Valdez, Joy Disability Mission, Inc.; Mr. Tim Kim, Missionary, and Mr. Greg Cho, Teacher, California State University, Maritime Academy. Seated from the left Ms. Eunmi Cho, Teacher, California State University Sacramento; Ms. Carmen Reyes-Zubiaga, NCDA’s newly appointed Executive Director and Mr. Martin Kim, Missionary. 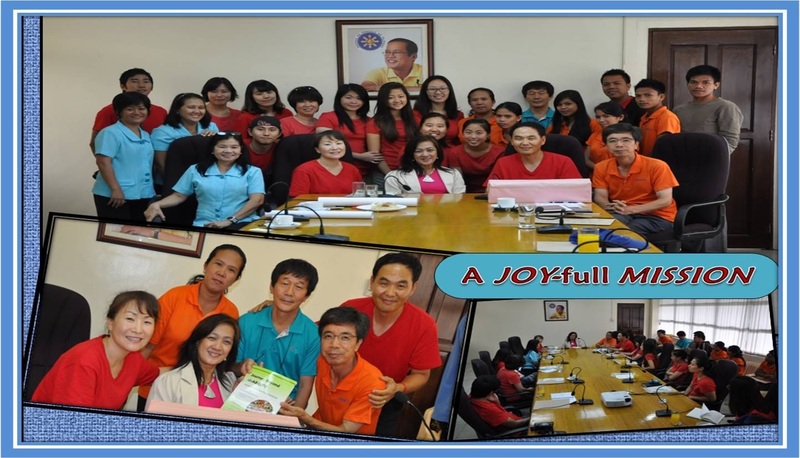 A 21-team man from Joy Center for the Disabled, International, composed of Korean and Filipino pastors, teachers and students met the newly appointed NCDA Executive Director Ms. Carmen Reyes-Zubiaga at the NCDA Board Room on 2 July 2012 . Joy Center shares their joy-full mission which is to oversee the operations of its year-long Saturday Schools in three locations, and facilitates summer, sports, and family camps. They also organize seminars and conferences to empower those serving persons with disabilities and promote the cause of disability ministry in the community, while sponsoring camps for parents of children with disabilities in order to foster a community support and encouragement.